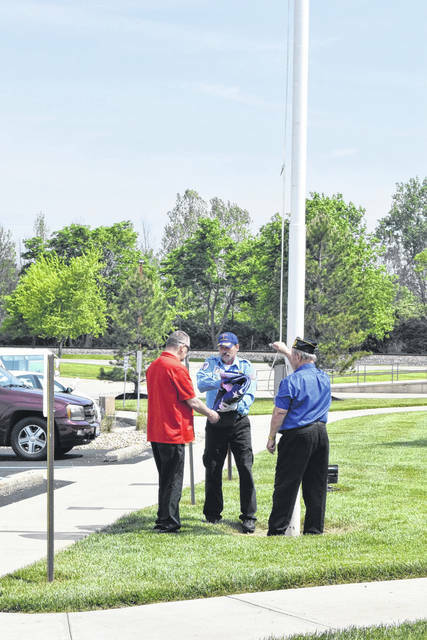 Bullen Ultrasonics held its annual flag raising ceremony on Monday, May 21, in recognition of Memorial Day and those who have died in service. 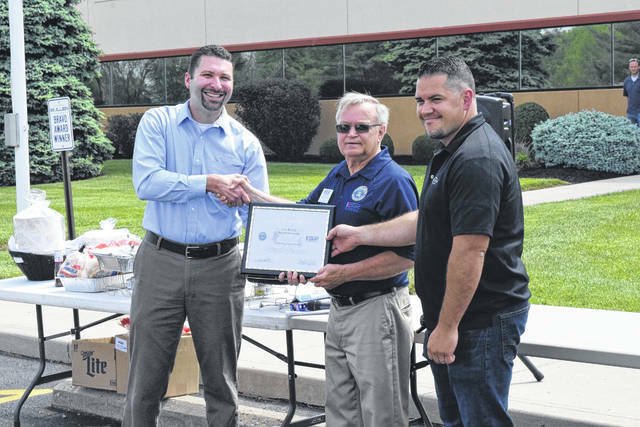 This year, Tim Beatty, president of Bullen, received the Patriot Award from the Employer Support of Guard and Reserve during the ceremony. 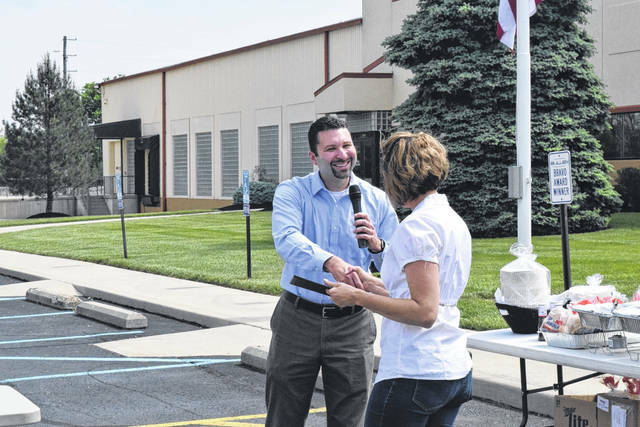 EATON — Bullen Ultrasonics held its annual flag raising ceremony on Monday, May 21, in recognition of Memorial Day and those who have died in service. This year, Tim Beatty, president of Bullen, received the Patriot Award from the Employer Support of Guard and Reserve during the ceremony. 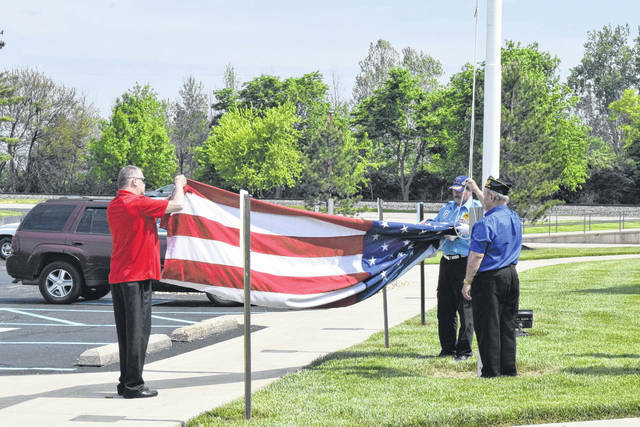 Bullen began holding the flag raising ceremony in 2013 as a way to honor veterans who served in the military and those who died in service for Memorial Day. They initially invited the Preble County Honor Guard, and it has been a tradition for the last five years. In addition, every other year, local police, fire and EMT personnel attend and use Bullen facilities and employees for training exercises. This year, Bullen decommissioned the old flag officially with the Honor Guard, who raised the new flag with a 21-gun salute. 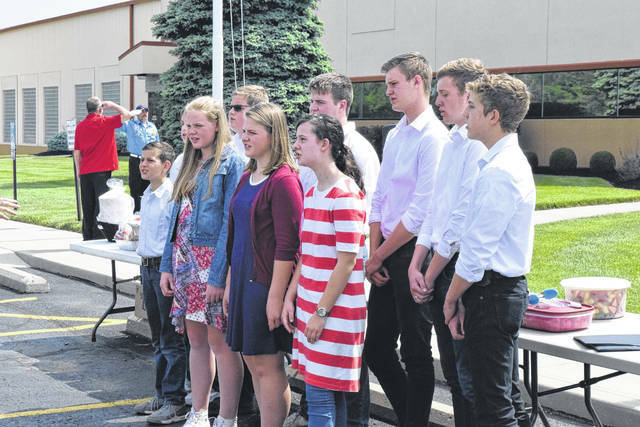 The Preble County Homeschool Ensemble sang the National Anthem and America the Beautiful. The flag was then lowered to half staff again to honor the victims of the Sante Fe School shooting. Eddie Reed of Employer Support of The Guard and Reserve (ESGR) presented Tim Beatty, president, with a Patriot Award. Sean Jones offered a prayer of remembrance, blessing, and thanksgiving. Lunch was then served. More than 100 people were in attendance, including the Preble County Honor Guard and their families, the Preble County Homeschool Ensemble, Eddie Reed for ESGR, and many of the 100-plus Bullen employees. 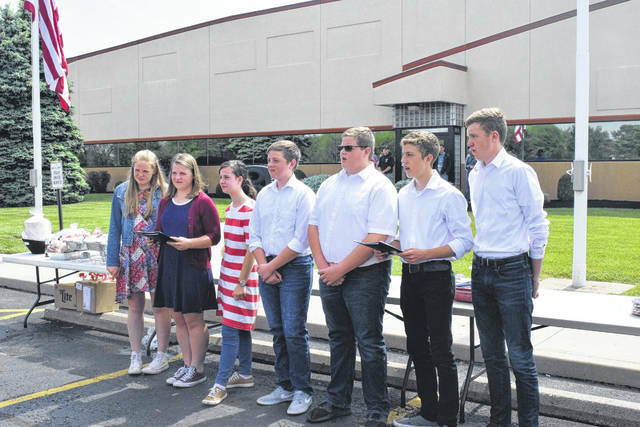 Beatty presented the Preble County Honor Guard with a certificate of thanks and a donation. He also presented the Homeschool Ensemble with a certificate of thanks. “We always want to take this time to pause and say thank you to anyone who has served and is serving here,” Beatty said. Following, Reed took the microphone to present Beatty with the Patriot Award. Reed said, “We need to build this company up, because from what I hear, there is nothing but great things this company does for its veterans and service members. We need to get them moving up the ladder. 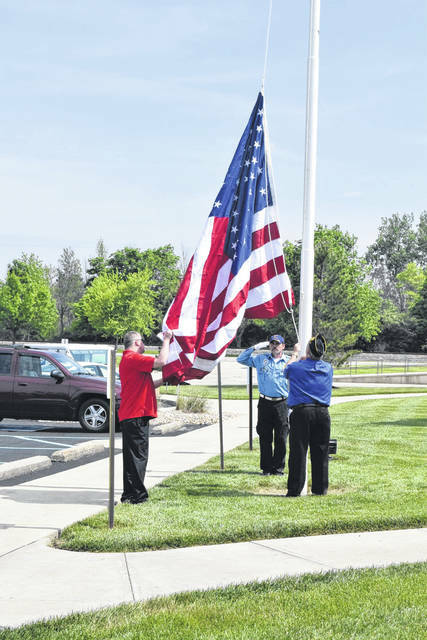 https://www.registerherald.com/wp-content/uploads/sites/41/2018/05/web1_Flag1.jpgBullen Ultrasonics held its annual flag raising ceremony on Monday, May 21, in recognition of Memorial Day and those who have died in service. 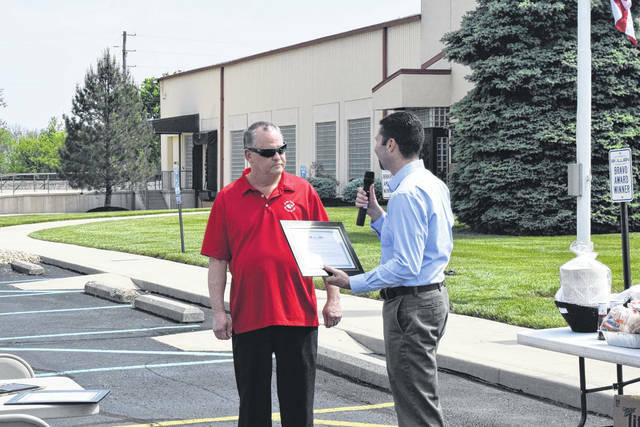 https://www.registerherald.com/wp-content/uploads/sites/41/2018/05/web1_Flag9.jpgThis year, Tim Beatty, president of Bullen, received the Patriot Award from the Employer Support of Guard and Reserve during the ceremony.